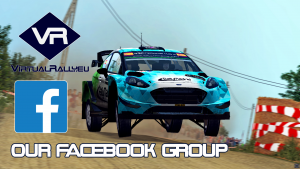 In 2019 season, VirtualRally.eu has a pleasure to invite all the drivers to compete in Virtual Rally Championship. Full name of the competition is Virtual Rally Championship 2019 by VR.eu. In highlights/reports from each rounds, also abbreviation VRC will be used. Championship will be conducted on platform Richard Burns Rally, using Wally’s plugin and all of the addons placed on plugin. For complex guide for beginners „How to start„, click HERE. Information about the cup are published on the website VR.eu, our Facebook fanpage and discussion group. For direct inquires to the organizer, please contact via private message on the FB fanpage, contact form on the website or directly on our e-mail administracja@virtualrally.eu. RBR Czech account is the only requirement to take part in Championship. It does not require any paid license. Categorically it is forbidden to use more than one RBR Czech account (aka. multiple accounts). If detected – these kind of behavior will be punished with ban. VR.eu provides prizes for the best drivers and teams participating in the Championship. Championship will consist of 13 rallies, chosen by selection of the most prestigious rounds of the World and Europe Rally Championship. – conditions on the road. In case, when at least one crew in a real rally will start to the stage, and that will be cancelled later (e.g. due to an accident), special stage will be part of virtual rally configuration. However, if special stage will be cancelled by the real rally organizer before the start of the crews, it will be deleted from virtual rally roadbook (itinerer) also. From the final score classifications for every driver, one worst results will be written off. The principle of the worst results writing off will be applied for both general classification and class classifications. In VRC final general and class classifications, 12 results will be counted. Rallies will last 7 days and will be held from Monday to Sunday. Applications for each rally will be held by the „enroll” function on RBR CZ plugin. Entry list will be opened at least a week before a start of the rally and closed 2 hours before its start. The organizer reserves the right to possible extension of the time, while entry list will remain opened. Start numbers for the drivers will be given, according to the following key. „Low” start numbers will be given to the drivers from „priority list”. These are best drivers from VRC 2018 season (winners of general and class classifications). Number „1” will belong to the VRC Champion. Other numbers will be assigned, basing on the order of applications for Championship. Championship calendar is located HERE. Allowed cars in the brackets. In the VRC, team classification will be conducted. Final score of the team in each rally consists of the sum of the points scored by team drivers in classes: VRC1, VRC2, VRC3, VRC4. Team points are collected by one – best driver of the team in each class. Classes VRC Historic WILL NOT count for team classification. – 15th place – 1 point. – 10th place – 1 point. The last special stage of the rally will be held as a PowerStage, well known from real WRC. Top 5 drivers, with the best stage times in the general classification of PowerStage (last special stage), will be awarded with extra points by key 5-4-3-2-1. Bonus points will not be awarded in class classifications. Together with VRC Championship, VRC Historic will be held. For VRC Historic, separate classification will be conducted and after the season – there will be announced VRC Historic Champion. Points scored by drivers in Historic cars will not count for team classification of VRC Championship. The organizer reserves the right to verify replays from random drivers and stages. Information about possible verification will be announced by organizer (section 5 and 21). In section 22 of the regulations – allowed and forbidden cuts will be defined. For making the matters easier, there will appear practical examples. This does not mean however, that only on mentioned special stages regulations apply. The rules apply to all tracks on similar principles. The organizer is obligated to announce a list of passes (replays) to be verified within 24 hours after end of the rally. Drivers are required to upload replay on a RBR Czech server within 72 hours after organizer’s announcement. Absence of replay or its too late upload will be punished with 5 minutes penalty for the driver in particular rally. The rules of clean passage and penalties for violations. a) The principle of at least one wheel staying on the road (absolute cuts ban) is valid in a tight (slow) corners, with an angle of less than or equal to 90 degrees (e.g. hairpins). In the fast sections, it is acceptable to cut with 4 wheels, but not more than the width if the car. Practical example: cuts (with 4 wheels) FORBIDDEN in hairpins on e.g. Foron, Cote, Maton, La Rocca and on tight bends e.g. Puy du Lac or Gestel. ALLOWED cuts (with 4 wheels) in the fast sections of Pian del Colle. The penalty for the offense (cutting slow corners with 4 wheels or cutting high-speed corners over the width of the car) – 15 seconds added to the result for each offense. b) It is forbidden to bypass fixed (permanent) obstacles outside the conventional route, resulting in cutting or passing obstacles on the wrong side (eg. chicanes). An permanent obstacle means any facility located along the route, regardless of the collision model, that it has. Practical example: It is FORBIDDEN to avoid „light” chicanes on Slovakiaring and Pian del Colle and „hard” chicanes on Sorica. The penalty for the offense (bypassing permanent obstacle) – 1 minute added to the result for each violation. c) It is forbidden to cut constant obstacle using its specific model of damage. For cutting an obstacle is considered visible damage to obstacle through contact with the car. Practical example: Taking down red cones on Sorica and destroying chicane on Pian del Colle is strictly FORBIDDEN. Exceptionally, we allow touching of small cones on stages such as RSI Slalom Shonen. The penalty for the offense (beheading constant obstacle) – 30 seconds added to the result for each offense. The organizer will not punish for the single „grazes” of permanent obstacles, when for example corner of the car will come into contact with the „light” chicane. However, in the case of notorious recurrence of such small errors (more than 5 per special stage – e.g. Slovakiaring), the driver can be penalized, depending on the frequency of these events (not less than 30 seconds). The organizer decides about qualification of the offense as illegal „cut”, or allowed „graze”. d) Unsportsmanlike driving „on the bands”, using imperfection of the model destruction (eg. ROC 2008) is strictly forbidden. The penalty for the offense (driving on the bands) – 2 minutes added to the result for each special stage, where the violation occurred. e) It is unacceptable to tackle the corner using the side of the road with all 4 wheels. A prime example is special stage Falstone. The penalty for the offense (using side of the road before entering the band) – 15 seconds added to the result for each offense. In case of discovering new ways to drive unsportsmanlike/cheating, unrecognizedin the rules, please contact us immediatelyand provide materials (screens/videos) confirming injustice. If it will be reported before the rally, it will be included in the regulations. If the new trespass will be detected during after-rally replays verification, organizer reserves the right to punish a driver. The penalty will be determined by a time profit, but will not be less than 30 seconds. If a driver has committed one of these offenses unintentionally(as a result of his/her failure), to avoid a penalty, driver is required to stop the car for at least 3 seconds immediately after that, when incident took place. The organizer will accept requests(to resume rivalry in the rally) with the message „did not start to SS…” and „did not arrive to time control…„. However there will not be accepted requests with the message „crashed on SS…„. Requests and protests does not consist so-called red screens. Requests should be sent via RBR CZ plugin. The driver has the right to protest, if he/she considers that the penalty applied by the plugin is unfair. Protest must be supported with replayuploaded on the RBR CZ server. Drivers can submit protests, using the form located HERE. Protests with video recordings (on youtube e.g.) as a proof will not be considered. The only source of verification is replay uploaded on RBR CZ server. In unusual situations, the organizer makes decisions. The rally organized by VirtualRally.eu should be completed at the latest 4 hours after its completion (the time of completion of the rally given on the rbr.cz plugin is valid). A competitor who finishes the rally at a later date will not be included in the final classification of the rally. To get points in the rally, you must complete a minimum of one special stage. Classifications posted on the GVRC are considered official results. It is unacceptable to slander the organizer. VirtualRally.eu Team does not have material benefits from their activity. Drivers opinions are very valuable in term of raising the quality of the Championship. However, it should be understood, that organizer has to deal with multiple voices and even the greatest certainty as to Your own reason does not give reason to disregard the opinion of others, especially those who put their time, work and above all – nerves in conducting the competition. Therefore, a public statement about finishing of the starts by fault of the organizer, will result – as desired – removal from the start list of the championship and of the community gathered about WR.pl. In case someone would change his/her mind (at the earliest after 60 days), comeback may occur after contacting the organizer. We emphasize that no one will be removed or punished for criticism of the decision made by organizer. It concerns mainly people who threaten (blackmail?) dropping out of the competition. VR.eu reserves the right to extend the regulations for a further points and clarification of these points, which are already existing in order to improve the organizational quality of the Championship. Drivers will be informed about any changes in the regulations (section 5).